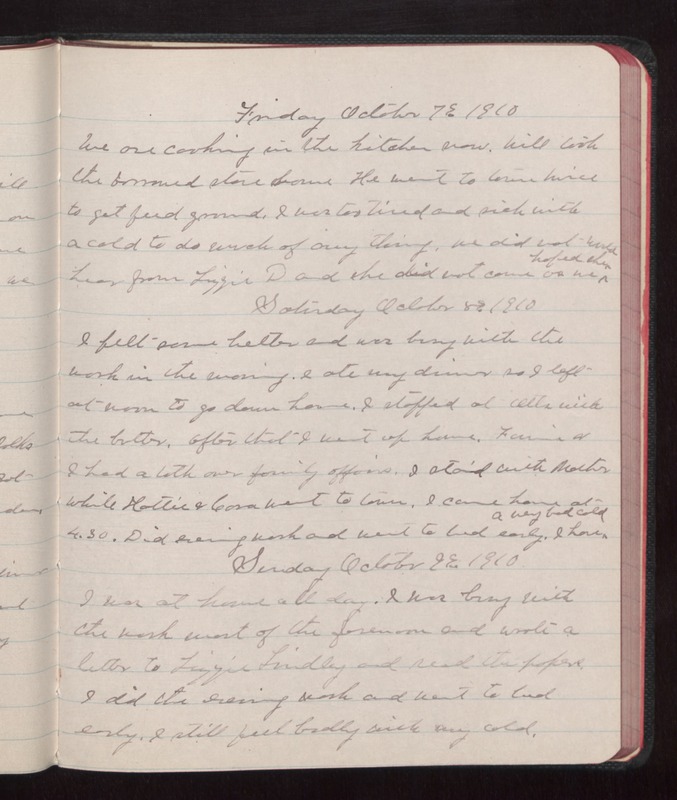 Friday October 7 1910 We are cooking in the kitchen now. Will took the borrowed stove home. He went to town twice to get feed [ground?]. I was too tired and sick with a cold to do much of any thing. We did not hear from Lizzie D and she did not come as we hoped she would Saturday October 8 1910 I felt some better and was busy with the work in the morning. I ate my dinner so I left out noon to go down home. I stopped at Otts with the butter. After that I went up home. Fannie & I had a talk over our family affairs. I staid with Mother while Hattie & Cora when to town. I came home at 4.30. Did evening work and went to bed early. I have a very bad cold Sunday October 9 1910. I was at home all day. I was busy with the work most of the forenoon and wrote a letter to Lizzie Lindley and read the papers. I did evening work and went to bed early. I still feel badly with my cold.